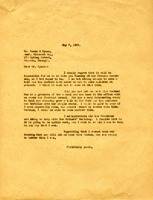 Martha Berry writes to Mrs. Inman to inform her that she plans to try and meet with her on the 16th and asks if it was okay to bring Inez to speak at the Martha Berry Circle. 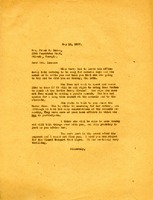 Letter to Glenn B. Ryman from Martha Berry informing him that she won't be able to attend the Kiwanis Luncheon like she promised because she is physically unable to do so. She informs him that she doctor's have told her not to make speeches at the present time. 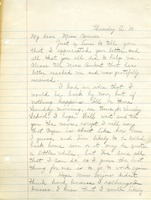 She instead asks if she can send Miss Wooten in her place. She informs him that Miss Wooten has an interesting story and is a graduate of the schools and has been working with her in the office ever since she graduated. She also adds that she recently gave a talk in New York and that the audience was captivated with her story. She apologizes to him once again and hopes he accepts her excuse. Wooten describes her father's condition, explaining that she believes he has stomach cancer and that the doctors expect him to die. Their only treatment is morphine at this point. Wooten further updates Berry on an antiques inquiry and shares that her father thinks the Berry Schools are "the greatest schools known." Inez writes from a visit to her 'Papa', sharing that she hopes to return to work soon.